Dr. Burynski: Antineoplastons appear to reverse cancer in some patients. For more than a quarter century, Washington has waged a high-profile "war" on cancer at a cost to taxpayers of some $30 billion. Figures recently reported in The New England Journal of Medicine indicate how the battle is progressing: Between 1970 and 1994 (the latest available figures), the cancer rate increased by six percent. Similarly, in 1995 the National Cancer Institute (NCI) reported that when frequency of the disease during the period 1975-79 was compared with that for 1987-91, the incidence among males was up 18.6 percent, and that for females increased by 12.4 percent. This apparent lack of progress in coping with the dread disease is especially disturbing when one considers the amount of time, effort, and resources expended by the orthodox medical community — including the American Medical Association (AMA), the American Cancer Society (ACS), and the Food and Drag Administration (FDA) — on frenetic efforts to delay or derail promising alternatives to the entrenched regimen of surgery, chemotherapy, and radiation. Assaults on such non-traditional remedies as laetrile (the science and politics of which were analyzed by G. Edward Griffin in World Without Cancer) and krebiozen come readily to mind. The most notable advocate of krebiozen, which at one time had nearly 20,000 case-history endorsements, was Dr. Andrew C. Ivy, onetime chairman of the University of Illinois clinical sciences department. Dr. Ivy's "establishment" medical credentials were impeccable. He had authored more than 1,000 articles published in scientific and medical journals, had served as a U.S. representative at the post-World War II Nuremberg trials, and had received bronze, silver, and gold medals from the AMA for his achievements. Even the FDA had sought his medical testimony on occasion for judicial proceedings. But once Dr. Ivy began advocating an unorthodox cancer therapy, he was promptly derided as a "quack." At the behest of the FDA, he and three associates were indicted in 1964 on 49 criminal counts for violations of the Food, Drug, and Cosmetic Act, mail fraud, mislabeling, making false statements to the government, and conspiracy related to the production and distribution of krebiozen (which the agency had outlawed the year before). FDA chemists claimed that krebiozen was simply a common amino acid found in man and animals. The subsequent trial, which lasted from April 19, 1965 to the end of January 1966, cost taxpayers an estimated $3 to $5 million. During the trial a letter was read into the court record by a doctor who claimed that while treating a cancer patient he had obtained krebiozen from Dr. Ivy's laboratories, and had administered it to a patient, but that the substance had done absolutely no good whatsoever. Under cross-examination, however, he eventually admitted that he had never treated such a patient and had never used krebiozen. Asked why he had lied, he replied that an FDA agent had written the letter and asked him to sign it, which he did because he wanted to help the agency put an end to "quackery." Lies and deception, needless to say, are the very essence of authentic "quackery." When the jury rendered its verdicts, Dr. Ivy and the others were acquitted on all counts. Indeed, the jury added that it believed krebiozen had merit. Yet as journalist and author Michael L. Culbert notes in Freedom From Cancer, "the propaganda campaign paid off, and krebiozen was left in the public mind as another unproven cancer remedy and Dr. Ivy was character-assassinated into the limbo reserved for pioneers who dare operate outside of the medical-governmental axis." Which leads us to the contemporary case of Dr. Stanislaw R. Burzynski, founder of the Houston-based Burzynski Institute that treats cancer patients with substances called antineoplastons. On May 27th, after less than three hours of deliberation, a federal jury in Houston acquitted Burzynski on the single remaining count of the 75 for which he and his clinic had been indicted by a grand jury in 1995. It was Burzynski's second trial this year. 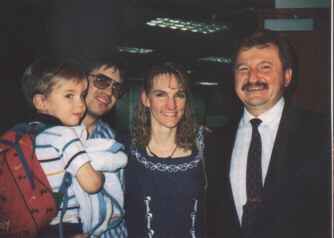 The first, which began in early January, entailed 20 days of testimony by more than 80 witnesses regarding 34 counts of mail fraud, 40 counts of introducing antineoplastons illegally into interstate commerce, and a single contempt-of-court count alleging that Burzynski and his clinic violated a 1983 federal court order precluding such interstate dispersion of the drugs. U.S. District Court Judge Simeon T. Lake III, who also presided at the second trial, declared a mistrial after an evenly divided jury deadlocked on all 75 counts. Lake then issued a directed verdict of acquittal on the 34 mail-fraud counts, asserting that the evidence presented by the government did not come close to justifying a conviction. Federal prosecutors announced that they would retry Burzynski and the clinic on the remaining 41 counts, but on May 19th (the day before the second trial began) they tossed in the towel on all 40 of the counts related to interstate commerce. Since the clinic was also dropped from the case, Dr. Burzynski alone was retried on the remaining contempt charge. Following Dr. Burzynski's acquittal, juror Stephenie Shapiro told reporters, "I just don't think that the state proved their case .... It was very unanimous from the beginning. It's not like anybody had to be talked into it." Weeks earlier, on April 18th, L. Darlene Phillips, a juror in the first trial, wrote to Attorney General Janet Reno to express her disgust at "how my time and tax dollars were wasted on this trial." She noted, "On two separate occasions the FDA had confiscated a total of 300,000 documents (i.e., patient records, MRI scans, progress charts, etc.) and for Dr. Burzynski to be able to continue to treat his patients, he had to purchase a Xerox machine, install it at the FDA office, hire someone to make copies, and to make it even more difficult, he was required to call a day in advance to make an appointment for copies to be made. To this day these documents have not been returned." Phillips also reminded Reno that Amy Lecocq, lead prosecutor for the first trial, "violated at least six federal laws governing subpoenas of journalists when she subpoenaed Dr. Ralph Moss, PhD [who had written favorably of Dr. Burzynski]. When he pointed this out to her, she withdrew the subpoena." The blatantly illegal, broad-brush subpoena had sought to compel Dr. Moss to produce every document in his possession — electronic, magnetic, printed, or otherwise — relating to Dr. Burzynski. Ms. Phillips further pointed out that "the prosecution failed to introduce even one witness who could say anything defamatory about Dr. Burzynski's character." She added: "One would think after four years of preparing for this trial they would have found at least one disgruntled patient, former employee, business associate, or colleague who had something negative to say about him." Phillips wondered if "our government has real 'criminals' to prosecute," and implored the Attorney General to "put a halt to the nonsense of a retrial by our federal government (namely the FDA) of Dr. Burzynski." Phillips' plea fell on deaf ears: Reno refused to intervene. Had Dr. Burzynski been convicted of all 75 counts in the original indictment, he could have received up to 290 years in prison and been fined in excess of $18 million. Today, for the first time since the grand jury issued its indictment, he is a fully free man. No longer is he under the cloud of a $100,000 bail bond, nor does he have to report to the federal courthouse every two weeks, nor seek permission to travel out of state. Born in Poland in 1943, Dr. Stanislaw Burzynski received his medical degree in 1967 from the Medical Academy of Lublin, ranking first in a class of 250. He earned a doctorate in biochemistry the following year. It was while working on his dissertation project that he identified certain naturally occurring peptides (protein fragments comprised of two or more amino acids) which he concluded might have something to do with controlling cancer. Persons afflicted with the disease, he noticed, typically had lower blood levels of the peptides — which he later termed "antineoplastons" — than did healthy individuals. When he refused to join the Communist Party (virtually a prerequisite for academic advancement at the time), Burzynski was drafted into the Polish army for an indefinite period which precluded the opportunity to conduct meaningful research on his discovery. In 1970, with the help of influential fellow scientists, he emigrated to the United States, where he would eventually encounter more harassment and persecution at the hands of the FDA and the Justice Department than he had under Poland's Red regime. From 1970 to 1977 he was a researcher and assistant professor at Baylor College of Medicine in Houston, where his research was sponsored and partially funded by the National Cancer Institute (NCI). It was during this time that he fleshed out his theory that the peptides he had stumbled across in human blood and urine (he now produces them synthetically) could correct and normalize certain types of malignant neoplastic (tumor) cells. Thus the term "antineoplastons." "We are no longer concerned with killing cells," he asserts, "but with changing the program inside the defective cell so that it will begin to function normally." Most experts agree that we all probably develop cancer millions of times during our lifetime. With trillions of maturing cells, millions of errors can and likely do occur, a problem further aggravated by exposure to thousands of chemical carcinogens, and such physical factors as radiation, bacteria, viruses, and unhealthy stress, that have plagued mankind throughout time. Normal cells, Burzynski explains, specialize to serve particular purposes. Once that specialization occurs, they no longer divide to form new cells. They do what they have been programmed to do, then fade and die, to be replaced by new cells. Some cells, however, are affected by carcinogens and other disrupting influences that cause them to become, in a sense, both destructive and "immortal." They neither specialize nor die, but continue dividing until they overwhelm normal cells. The result is cancer, which Dr. Burzynski contends is essentially a disease of cell differentiation. "It is obvious," he points out, "that everybody would develop cancer if we didn't have a certain protective system in the body. This is the biochemical protection system .... Antineoplastons correct the program inside the cell and force it toward normal development" by serving as "biochemical micro-switches" that turn off oncogenes (the genes, found in all cells, that are responsible for cell malignancy) and turn on tumor-suppressor genes that stop them. The concept that cells can be reprogrammed from abnormal to normal, precluding the need to eliminate them, may explain much of the opposition that Dr. Burzynski has encountered from orthodox medicine and its FDA enforcement arm. The theory offers an alternative to the surgery-chemo-therapy-radiation approach which holds that cancer cells must be either destroyed on-site or excised. As Dr. Julian Whittaker, MD, editor of the newsletter Health & Healing, wrote in March of this year, "Though the FDA is the obvious 'point-man' in the persecution of Dr. Burzynski, the real force is coming from the cancer treatment establishment. Just imagine all the physicians, technology, and medical facilities that feed off chemotherapy, radiation therapy, and surgery. They are now threatened by a more effective and less dangerous therapy that can be administered in a doctor's office or by patients at home." THE NEW AMERICAN is not qualified to reach conclusions regarding the scientific validity of Dr. Burzynski' s antineoplaston theory. However, since opening his private clinic in Houston in 1977, he has treated some 3,000 advanced cancer patients, most of whom turned to him after exhausting conventional treatments. Hundreds are convinced that antineoplastons literally saved, or have significantly extended, their lives, without the debilitating side effects characteristic of such conventional therapies as radiation and chemotherapy. Consider, as one example, the case of Dustin Kunnari. In February 1994, when he was two and one-half years old, Dustin was diagnosed with an aggressive type of brain tumor called medulloblastoma. It is the second most common brain tumor found in children, and whether treated with conventional therapy or left untreated entails a life expectancy of only one to four years. Three-fourths of Dustin's tumor was removed surgically, after which his parents, Jack and Mariann of Aurora, Minnesota, were encouraged to enroll him in a study at the University of Minnesota that would initially treat his cancer with chemotherapy, then radiation. The possible side effects, they were informed, included hearing loss, stunted growth, hair loss, learning disabilities, sterility, and leukemia. They were, however, assured that the success rate of such therapy reached as high as 40 percent. But when they requested a few names of those parents whose children had been successfully treated, so they could confirm the results firsthand, their request was denied. The Kunnaris opted not to enter Dustin in the program, electing instead to give Dr. Burzynski's treatment a try. It is called freedom of choice, but it goes down hard with establishment medicrats. Jack Kunnari told THE NEW AMERICAN that when they sought to retrieve Dustin's medical records from the University of Minnesota, they were told that in medical cases the opinions of doctors take precedent over those of parents, and that they could be taken to court unless they agreed to enroll Dustin in the study. "Until the day we left for Houston, there were still threats coming," Mr. Kunnari recalled. Dustin's antineoplaston treatment began in April 1994. Within six weeks an MRI (Magnetic Resonance Imaging) scan showed complete remission of the tumor. Following another year of treatment, another MRI indicated that the tumor was recurring. The dosage of antineoplastons was increased, and the tumor once again receded. According to Dustin's latest MRI on May 1 st of this year, the tumor remains in remission. Indeed, he was recently taken off intravenous administration of the drug and is presently receiving only a maintenance dosage via capsules. His parents describe him as a robust and basically healthy six-year-old. The side effects of the therapy have been nil. The government's prosecution of Dr. Burzynski, which raised the specter of losing their only source for a drug they are convinced has been of enormous benefit to their son, intensified the Kunnaris' anguish — and their anger. "I guess we were always aware," Jack Kunnari told THE NEW AMERICAN, "that if you go with an alternative [therapy] there would be some opposition. But we never dreamed it would be as intense as it has been. From the time the first MRI showed that Dustin's tumor was gone, there was the feeling that we had accomplished something. We stood up for what was best for our son. We stood up to the University of Minnesota despite the legal threats and such. It was a feeling of such joy and appreciation. Then you get hit with these indictments and court rulings against Dr. Burzynski." Mr. Kunnari recalls that "we had just gone through an emotional fight to get our son to the point where the tumor was gone, restore him to a measure of health, and now our government was stepping in and we had to fight it. I don't know how you can explain the range of emotions, but I guess the best way to describe it is a roller-coaster ride. Initially, your son has a brain tumor, so you're down and feeling pretty bad about things. Then you find out about this doctor and you get a feeling of hope, the MRI looks good, and your hope increases. And then the government steps in and says you can't have the treatment." In a February 19, 1997 letter to Judge Lake, Dr. Robert E. Burdick, MD, summarized his review of 17 Burzynski patients (among 40 of his patients with brain tumors who were included in an FDA-approved trial one year earlier) who had responded to treatment with antineoplastons. Dr. Burdick has practiced medical oncology for nearly three decades and is on the faculty of the University of Washington Medical School. After noting the "frustrations that neuro-surgeons, radiotherapists, and we medical oncologists have regarding our ineffective treatment of malignant brain tumors," and presenting a brief overview of the sundry types of malignant tumors, Dr. Burdick noted that it "is very rare, currently, to ever get a complete remission or cure in a patient who has a malignant brain tumor using our standard modalities of surgery, radiation, and chemotherapy. By the time a tumor is large enough to be clinically detected, it has involved such critical structures that to remove it surgically would result in a patient who is left in a vegetative state or is markedly more disabled than he was prior to the surgery." Dr. Burdick noted that, "as a rough estimate, neurosurgeons do well to cure 1 in every 1,000 brain cancer patients they operate on. Radiation therapy slows the growth of adult tumors, gaining perhaps one month of life and again may result in a cure of only 1 in 500-1,000 patients, those cures being in the pediatric age group. Similarly, chemotherapy research, despite 30 years of clinical trials, has not resulted in the development of a single drug or drug combination that elicits more than an occasional transient response in primary brain tumors .... In fact, chemotherapy in brain tumors is so discouraging that in many parts of the country patients with brain tumors are not even offered the option of chemotherapy." Based on his careful analysis of each of the 17 patients in the study who responded to treatment with antineoplastons, Dr. Burdick found that "there were 7 complete remissions, one patient having had a second complete remission after he discontinued antineoplaston therapy which resulted in his tumor regrowing. There were nine partial remissions, two cases of stable disease, and no disqualifications. The average duration of therapy with antineoplastons necessary to obtain a complete remission was 10 months with a range of 2 to 20 months. The average duration of antineoplaston therapy necessary to obtain a partial response was 8 months with a range of 1 to 14 months. The average duration of complete remissions is 16+ months with all six complete remissions continuing to remain in remission to the best of my knowledge through January 1, 1997. The duration of complete remissions ranged from 3+ months to 40+ months with the duration of partial remissions averaging 18+ months and ranging from 5 to 78+ months." Summing up, Dr. Burdick told Judge Lake that he was "very impressed with the number of complete and partial responses that I have seen here, compared with the number of such responses that I have seen in my own personal experience. The responses here are also far in excess of any prior series of patients published in the medical literature." Even after two patients were subsequently downgraded from "partial remission" to "stable disease," the response rate (partial or complete remissions) was "an astounding 33% with a complete remission rate of 15%. Such remission rates are far in excess of anything that I or anyone else has seen since research work on brain tumors began." Dr. Burdick asserted that it "is very clear that the responses here are due to antineoplaston therapy and are not due to surgery, radiation or standard chemotherapy." He concluded that research "needs to continue on these very promising agents," to determine such things as "the optimal dose of these agents, the optimal route of administration, the optimal duration of treatment and many other details too numerous to mention." Dr. Burzynski opened his clinic in 1977. Prior to 1985, FDA drug-approval procedures were not incorporated into Texas law, so he was advised by his attorney that he could treat patients with innovative medicine as long as he did not engage in interstate commerce. In The Cancer Industry, Dr. Ralph Moss recalls that Burzynski would have preferred to obtain FDA approval, but the roadblocks inherent in the agency's process were virtually insurmountable. The normal process, Moss writes, "is for a new substance to be discovered at a major medical center and then turned over to a drug company for development. If the company decides it is economically feasible, it will then battle its IND [Investigational New Drug] application through the FDA." But even then "it is often unsuccessful." Since none of the drug companies expressed an interest in Burzynski's compounds, he opted to develop them himself. But Moss writes that with virtually no capital with which to finance a run through the FDA maze, Dr. Burzynski "was caught in a classic catch-22 situation. If he tested antineoplastons in humans, the FDA was sure to come down on him eventually. But if he didn't so test them, he could never win FDA approval, since antineoplastons, being species-specific, are not generally effective in animal treatment experiments." The Declaration of Helsinki, adopted in 1964 by the World Medical Assembly and subsequently endorsed by Congress, states: "In the treatment of the sick person, the doctor must be free to use a new therapeutic measure, if in his judgment it offers hope of saving life, reestablishing health, or alleviating suffering." Burzynski decided to treat patients, compile thorough records, finance future development of the drugs with patient fees, and take his chances with the FDA. The FDA first visited Burzynski's facilities in 1978. The event was, in sharp contrast to the harassment and legal turmoil that would follow, quite congenial. Burzynski is first to admit that his manufacturing process at the time was rather amateurish, and that the FDA's constructive criticisms enabled him to make needed improvements. At the time, most of his problems were emanating from the local medical establishment. Moss writes: "In 1978 Burzynski became the focus of an investigation by the Board of Ethics of the Harris County Medical Society. The charge was using unapproved medications of his own devising. They repeatedly called him in for interviews and instructed him not to give any interviews to the press." 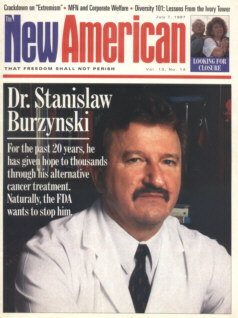 Burzynski complied with the press blackout, but in 1979 Penthouse magazine ran an article entitled "The Suppression of Cancer Cures," which described his plight, and in 1981 ABC' s 20/20 featured a segment entitled "The War on Cancer: Cure, Profit or Politics?" during which commentator Geraldo Rivera asserted: "The deeper we looked into the story, the more we realized that Stanislaw Burzynski is really not a maverick at all. His work is very much in the scientific mainstream, that burgeoning field of cancer research that's pin-pointing the body's own natural materials, its own proteins, to control irregular cell growth...."
In the wake of such national publicity, hundreds of cancer patients began visiting the Houston clinic for treatment, and no more was heard from the local Board of Ethics. Trouble at the national level, however, was beginning to metastasize. In 1983, the American Cancer Society placed Dr. Burzynski on its "unproven methods" blacklist of practitioners with which it disagrees. Later in the year, the FDA filed civil suit in federal court to stop him from manufacturing, or treating patients with, antineoplastons. An indication of the FDA's arrogant attitude was reflected in a motion dated May 2, 1983, in which its chief counsel for enforcement warned, "If this court declines to grant the injunctive relief sought by the government, thus permitting continued manufacture and distribution of antineoplastons by defendants ... the government would then be obliged to pursue other less efficient remedies, such as actions for seizure and condemnation of the drugs or criminal prosecution of individuals...." U.S. District Court Judge Gabrielle McDonald barred Burzynski from shipping the drug outside the state, or otherwise introducing it into interstate commerce, but authorized him to treat patients within the state of Texas. "Nothing contained heroin shall be construed as restraining, enjoining or in any way prohibiting the manufacture, processing, packing, holding, promotion, labeling, sale or distribution of antineoplastons ... when it is undertaken strictly and wholly intrastate," her order stated. This partial victory for Dr. Burzynski infuriated the FDA, which promptly moved to circumvent the court order and, it hoped, close down the clinic. 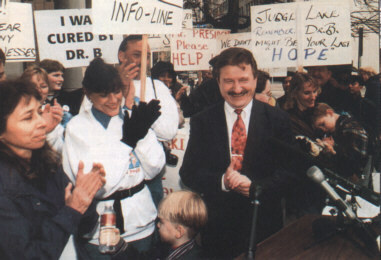 When Dr. Burzynski and some of his patients filed suit against the agency in the hope of ending the harassment, Judge McDonald rejected their request to allow a jury to hear their case, but did find that the FDA had disseminated false and misleading information about Burzynski to prospective patients, insurance companies, and public officials. Her October 24, 1985 ruling demanded that it stop doing so. It was earlier that year that FDA agents raided Dr. Burzynski's clinic and seized more that 200,000 pages of documents, including patient records. Without the records, Burzynski was seriously hamstrung in treating his patients. As noted earlier, he was required to install a copier at FDA headquarters, at his expense, and make appointments in advance to photocopy the needed records. In 1986, an additional 100,000 documents were subpoenaed for the first grand jury investigation of his activities. After scrutinizing the evidence, the grand jury declined to indict. Judge McDonald's 1983 partial injunction stated that "the jurisdiction of this court is retained for the purpose of enforcing or modifying this injunction and for the purpose of granting such additional relief that hereafter may appear necessary or appropriate." Which meant that government prosecutors had a civil-remedy alternative to criminal prosecution regarding the key question (on which the other charges were based) of whether or not Dr. Burzynski had violated Judge McDonald's directive. As interpreted by Burzynski, the order did not bar his clinic from providing antineoplastons to patients from out of state who traveled to Houston to pick them up, then returned home. He was treating such patients within Texas, and neither he nor the clinic were shipping the drugs elsewhere. Nor, he contended, did the court order apply in instances where patients themselves could not, for health or economic reasons, make trips to Houston, so had representatives (friends, relatives, etc.) secure supplies of the drug from the clinic on their behalf. Judge McDonald's order did not specifically preclude such activity, but the government argued that it was illegal for Burzynski or his clinic to provide antineoplastons to persons whom they knew would then travel with or ship the drugs beyond state borders. Federal law required that Judge McDonald's order be "of reasonable specificity," but on this key point it was imprecise. The government could have asked her to clarify the matter by restating her intent, but it did not. As Gary Anderson, a juror in the second trial, explained, "What we felt was that the order was ambiguous. And it was our feeling that he [Burzynski] made an attempt to do what he thought he should be doing." Indeed, Burzynski had never tried to hide the fact that he was treating persons from other states at his clinic. Their home addresses were listed on the paperwork he had been submitting to the FDA for years. In 1990, a second grand jury was convened in yet another attempt by the FDA to garner an indictment, but it, too, cleared Burzynski. In 1994, a third grand jury was convened. Again, there was no indictment, but an Assistant U.S. Attorney assigned to the case was dismissed after local reporters discovered that he had subpoenaed the campaign contribution records of a local politician who was a fervent Burzynski supporter, then leaked to the press a false story indicating that misuse of campaign funds was part of the ongoing investigation of Burzynski. Up to that point, then, three separate grand juries had scrutinized the Burzynski record and had refused to indict him on so much as a single count. It was a remarkable series of victories for the beleaguered physician, since, as Representative Joe Barton (R-TX), chairman of the Subcommittee on Oversight and Investigations of the House Committee on Commerce, noted in a September 7, 1995, letter to Attorney General Reno, "It is extraordinarily rare for a grand jury to fail to indict at the request of the U.S. Attorney. As far as I know, a grand jury failing to indict some three to four times on essentially the same base of facts is virtually unprecedented. It would appear that the FDA and the Justice Department are abusing the grand jury process to harass and punish Dr. Burzynski for persuading a federal judge that he is not violating the law by practicing medicine within the State of Texas." In 1994, the FDA's oncology division granted Dr. Burzynski permission to conduct four Phase II (efficacy) clinical trials on antineoplastons. FDA inspectors scrutinized and approved his manufacturing facility. It appeared that a truce between the two sides may have been reached. Then, on March 24, 1995, Dr. Burzynski appeared on the CBS program This Morning with three patients whose cancers had been diagnosed as terminal years earlier, but who now claimed to be free of the malignancies following treatment with antineoplastons. That afternoon the FDA again raided the Burzynski clinic, spending some seven hours rummaging through file cabinets, drawers, and computers, and eventually hauling off numerous boxes crammed with documents. It was the first step on the road to a fourth (this time successful) attempt by the FDA to secure a grand jury indictment. For eight months, subpoenas were issued to Dr. Burzynski, many of his present and former employees, and other persons with whom he had been associated or who had spoken or written favorably about his work. It was after publishing a letter vigorously condemning the March raid that author Ralph Moss was served with the bogus subpoena covering every document in his possession relating to Dr. Burzynski. On November 15, 1995, FDA Commissioner David Kessler testified before the Barton subcommittee. Questioned about the Burzynski case, Kessler vigorously denied that there was a pattern of retaliation against the physician. Five days later, the U.S. Attorney's office in Houston announced the 75-count indictment by the fourth grand jury. There is no need to reprise the testimony from the enormously expensive trial. Judge Lake's directed verdict of acquittal on the mail fraud counts, the prosecution's decision to drop the interstate commerce charges, and Burzynski's swift acquittal on the contempt charge speak for themselves. It should be noted, however, that since late 1996 the FDA, perhaps prodded by pressure generated by the Barton hearings, has allowed the Burzynski clinic to register patients, including those from out of state, under dozens of study protocols qualifying them to receive antineoplastons by mail. Which means that at the time he was twice standing trial for contempt of an ambiguous, ancient court order that supposedly barred him from introducing antineoplastons into interstate commerce, he was legally authorized to ship the drugs to patients anywhere in the country. Jurors, at least those in the first trial, were not told about it. Constitutional authority Dan Smoot once observed, "A nation which values anything — even good health — more than it values freedom will lose its freedom." Needless to say, the best prescription for good health is freedom — freedom to choose the type of medical care one prefers, from the practitioners one prefers, who provide medications and other services one prefers. A truly free market in health care would enable innovators such as Dr. Burzynski to make a case for their discoveries in competition with others both within and without the "orthodox" medical establishment, unhindered by a dictatorial government bureaucracy that, in the name of protecting our health, often undermines it. In 1991, results of an FDA-approved Phase II (efficacy) trial involving 20 patients with varying stages of astrocytoma (the most common brain tumor in children) were published by Dr. Burzynski in Recent Advances in Chemotherapy. Nineteen had received one or more prior standard therapies to which their tumors did not respond. There was complete remission of the tumors in four patients, partial remission in two others, while ten others were diagnosed with "objective stabilization" (less than 50 percent decrease in tumor size). Later, two of the ten patients in that latter category improved to the point that one was reclassified "partial remission" and the other "complete remission." All told, 16 of the 20 patients stabilized or improved, a startling result considering the severity of their conditions when the trial began. In September of last year, Dr. Burzynski submitted brain scans of 29 of his clinical trial patients for review by a neuroradiologist at the Barrows Neurological Institute in Phoenix, Arizona. All 29 had been diagnosed as terminal when their treatment with antineoplastons began. A subsequent report noted complete remissions in 13 patients, partial or initial responses in eight others, and no response to the treatment in the remaining eight. There are also some indications, though at present based solely on animal studies, that in addition to treating some types of cancer, antineoplastons may also be helpful in preventing them from developing in the first place. Researchers at the Burzynski Clinic and at Japan's University of Kurume Medical School both found indications that low doses of a synthetic form of one type of antineoplaston administered orally prevented lung, breast, and liver cancers in the test animals. — R.W.L. Released for informational purposes to allow individual file transfer, Usenet, and non-commercial mail-list posting only. All other copyright privileges reserved.